I was tagged by my dear friend Alma Katsu to participate in this infamous NEXT BIG THING meme that’s going around. I was asked to answer the following questions about the book I was working on at the time, and then tag more people at the end. It’s the sequel to my fairy tale novel, Enchanted. Where Enchanted‘s main fairy tales were Cinderella, The Frog Prince, and Jack and the Beanstalk, Hero is based mostly on Petronella, The Snow Queen, and Hansel and Gretel. I wish I knew! Peregrine is almost pretty, with dusky skin and long dark hair. Saturday is tall and blonde, with a very athletic figure. If anyone has suggestions, I’m willing to hear them. Um…I can do it in two: Peregrine, whose father died of the Forgetting Sickness, is cursed into the body of a blind witch’s daughter. Saturday is mistaken for her infamous brother Jack, and tasked with rescuing them both from the witch’s clutches. Hero will be published by Harcourt Children’s Books in October 2013. All together, probably about 4 months. There was a big gap in between where I had to change the outline three times before I could finish the zero draft. I tell people that the Woodcutter sisters series is “Once Upon a Time” meets The Princess Bride (the book, not the film). I would shelve it next to Patricia McKillip, Tamora Pierce, Robin McKinley, Jane Yolen, and Diana Wynne Jones. I was most inspired by the story of Petronella, a picture book I owned as a child by Jay Williams, illustrated by Friso Henstra. 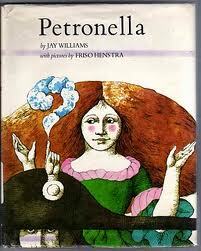 Petronella is a 1973 feminist retelling of the Grimms’ “Master Maid,” which just so happens to be my editor’s favorite fairy tale. Everything after that just fell into place. Despite its fairy tale trappings, Hero deals with two very important contemporary issues close to my heart: Alzheimer’s disease and gender identity. I encourage you to follow the links to their websites and hear what they’re working on. This entry was written by Princess Alethea and posted on December 26, 2012 at 8:03 am and filed under Friends, Hero, Interview, mermaids. Bookmark the permalink. Follow any comments here with the RSS feed for this post.